The central field bears the image of the obverse of ferding struck in 1515, featuring the family coats of arms of Riga Archbishop Jasper Linde (1509–1524) and Master of Livonian Order Wolter von Plettenberg (1494–1535), with the year 1515 above them; the legend MO[neta]:AR[c]|HE:PI[scopi]|ET.MA|GI[stri].LIV[oniae] (A coin of Archbishop and Master of the Livonia), enclosed by two lines of dots, is running around it; the long cross of the Livonian Order cuts the legend into four segments. The shining outer ring bears semi-circled inscriptions LATVIJA and 5 EURO at the bottom and on right respectively. The central field bears the image of the reverse of ferding struck in 1515, featuring standing Virgin Mary with a child in right hand and sceptre in left; the image is encircled by a halo and the legend MARI[a]:TU[um]:SALVA.PO[pulum] (Mary, save your people! ), enclosed by two lines of dots. The shining outer ring bears semi-circled inscriptions 2015 and VĒRDIŅAM 500 (500 years of ferding) at the bottom and on top right respectively. Latvian writer Kārlis Skalbe (1879–1945) wrote a "Fairy Tale about a Ferding" (1912), in which a poor bathhouse attendant Ansis finds a ferding, which, whenever spent, returns to its owner's pocket. Overcome by greed, Ansis lives out his life, spending and respending the miracle coin. Having accumulated fabulous wealth and being envied by all, he has become so selfish that he does not even help his destitute mother. The ferding does not bring satisfaction to Ansis and, in the end, it is the Devil, the true owner of the coin, who reclaims it. This fairy tale, with its implied advice to tie one's interests and gains to the needs of other people, was written at a time when the ferding could only be found in museums. The name of this Livonian Confederation coin is of German origin (verding; in the Middle Low German dialect verdink is a quarter). In the monetary context, it referred to a silver coin equal to a quarter mark. In 1515, new coin striking regulations were adopted reflecting the search for larger value legal tender characteristic of Western Europe at that time. In Riga, silver coins of greater denominations – marks and ferdings – were struck. One mark was worth four ferdings or 36 schillings. The first ferdings were co-issued by the Archbishop of Riga Jasper Linde (1509–1524) and Master of the Livonian Order Wolter von Plettenberg (1494–1535). Ferdings were struck from silver of .930 fineness in Riga, Tallinn and Tartu. As of 1526, the ferdings struck in Riga depicted the large coat of arms of the city of Riga (a lion's head in a gate with two towers and crossed keys and a cross above the gate). As the domestic situation changed and later, with the Livonian war beginning (1558), the value of the silver content of the coins and their value relative to other monetary units were subject to constant change. In 1525, the ferding was equated to 10 schillings and in 1551–1557, to 14 schillings. In 1557, ferdings were being struck from silver of .578 fineness. 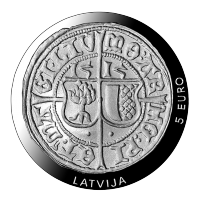 When in the mid-16th century the Livonian Confederation collapsed, Riga managed to retain its free city status (1561–1581), and the town council of Riga continued to mint coins (irregularly, also ferdings). Around 1565, the silver content in the Riga coins was secretly reduced, and ferdings were struck from silver of .437.5fineness. As the period of Riga's free city status ended, ferdings disappeared from circulation. During the period of Polish rule, Governor of the Duchy of Pārdaugava Jan Chodkiewicz (1566–1579) had a small amount of ferdings struck in the Dole Castle in 1573. During the so-called Swedish times, ferdings were not struck, but their name was transferred to dreipolchers, which were different in terms of metal content, weight and size but still amounted to a quarter mark. As Riga (1710) and Vidzeme (1721) were incorporated into the Russian Empire and Russian rubles and kopecks came into circulation, the ferding was equated to 1.5 kopecks as is evidenced by entries in the Riga accounting books and 18th century corvee regulations. The euro collector coin issued by Latvijas Banka is meant to fulfil a historic mission: it will reintroduce the ferding as a real silver coin, not just as something featured in folk songs and fairy tales. 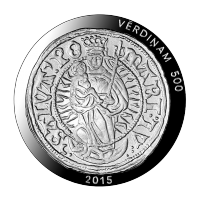 It is not exactly a circulation coin for everyday use but rather a little miracle, which features Virgin Mary holding a child and sceptre, protected by the family coats of arms of both the Archbishop of Riga and the Master of the Livonian Order, and is empowered to promote understanding of interrelatedness of the European monetary system. Latvia is celebrating the 500th anniversary of an important historical evidence represented by the Livonian ferding.